Featuring music icons of past and present. Some tragically gone, others still going strong. by us with all framing and finishing done to order in studio. Cult figures and iconic stars of the big screen captured in this exclusive art collection. Featuring classic movies such as Star Wars, Scarface, Pulp Fiction and many more. These canvases are limited edition as they have been produced using subtle and soft colours to create a collection with a retro feel to it. Only 20 of each item to be produced! multi panel artwork. These are just a small gathering of my favourites. Bring the bright colours of the big city to your home with this selection of canvases. is guaranteed with our unique selection of cityscape art! Stunning seascape art prints, beautifully colourful and vivid. All featuring a view of the sea. scenery" theme and soft sunlit finishes in mind. Nature at its best on canvas. Abstract art for adding a contemporary and stylish feel to any modern living room. These floral canvases are the perfect choice for adding a touch of nature to your home. collection of other vivid floral wall art in our range including a "colour cut" finish. brand new range of 3D canvas prints. Free 3D glasses included free with every order. colours. All available in a range of sizes. We also have a Space Invaders tribute canvas. art collection is new and exclusive for 2012! Keep up to date with the latest news and new additions at SmartModernArt.com. Subscribe to our RSS feed or view our Web Log for the latest great offers and brand new canvases. There can some confusing jargon on art websites. Words such as giclee for example and perhaps you know what a stretcher bar is. Read our Frequently Asked Questions and About Us page if there is anything you are not sure about regarding the process involved with creating your canvas. Welcome to the SmartModernArt.com online canvas art print shop. 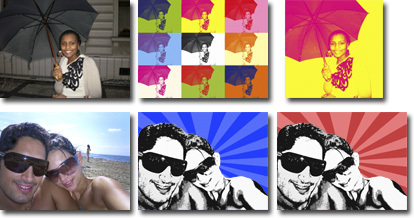 Canvas art prints have fast become the must have accessory for today's home or business. 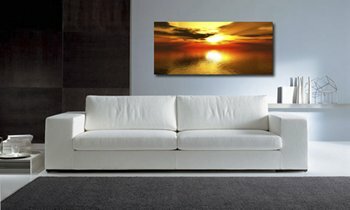 SmartModernArt.com have put together an extensive collection of canvas art prints to capture your imagination and provide you with a unique and beautiful visual investment for an affordable price. Why buy from us? you may be thinking. Please Read on! 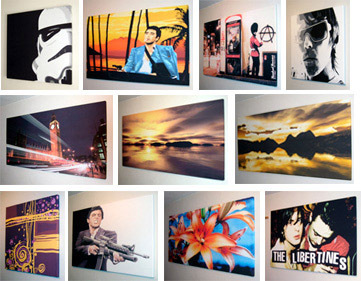 Here at SmartModernArt.com all our canvas art prints are created with pride and passion on demand using high grade UK sourced materials. We print, finish and frame every canvas on site to order. No warehouse storage of mass produced canvases but a range of custom art that is printed and framed exclusively by us in house on 100% cotton canvas using high quality UK produced stretcher bars. Our in house design team are dedicated to bringing you the latest exclusive up to date canvas art and modern wall art including canvases based on some of the greatest movies, musicians and groups of all time. Extra large multi panel art, retro pop art, Banksy canvases, New York cityscapes, gorgeous landscapes, seascapes, abstract concept canvases and photographic images all with an exclusive Smartmodernart twist. Our galleries are constantly updated with new lines being added on a regular basis as well as limited edition prints also on offer. 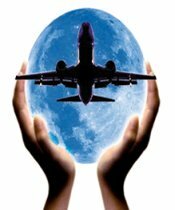 Our friendly and efficient service is first class and our art speaks for itself. So if you're looking for a cool and contemporary giclee canvas art print that wont break the bank look no further than the SmartModernArt canvas art collection. 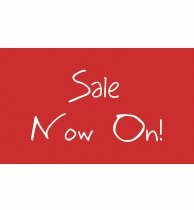 Free UK p&p on all items. Your canvas will also arrive ready to hang with free (and very simple to use) hanging kit and care instructions included. We only use the fine, high quality UK sourced materials in our canvas production process. See our About Us page for more details. This Weeks Super Special Offers! Your Photo to Canvas FREE SERVICE! No charge to have you photo turned into a unique piece of canvas artwork. Customized finishes include our Andy Warhol style, Pop Art style or if you just want the picture "as it is" we do all the resizing, colour correction and enlargement, all for free! You would only pay for the size of the canvas ordered and there is no commitment when you send your pics to us. Having your photos on canvas is a great way to have your favourite pictures turned into a unique canvas art print. They are excellent gift ideas and the perfect way to capture those images that are important to all of us. And best of all we offer this service free. No extra charge at all, so whether you just want a photograph to be enlarged or you want your picture converted to a Pop Art/Warhol style we can do it for no extra charge. "Spot on just what my daughter wanted" Phil Taylor - Abergavenny. "Picture was beautiful thank you so much" Susan Ainsworth - Gwynedd. "First class helpful and great quality product at the right price" Harry Daniels - Scarborough. "Very good service, beautiful print and very quick. Would use again" Madeleine Quested - Ashford. "Very Good quality product and print finish. Would recommend and use again" Peter Weaving - Shropshire. "The print was amazing. More people should buy from SmartModernArt" Daniel Wigmore - Haverhill. "Just wanted to let you know how happy I am with your company. Awesome customer service, awesome product! Thanks :)" Kristina - Virginia USA. In amongst our selection of art we have a number of mini collections. 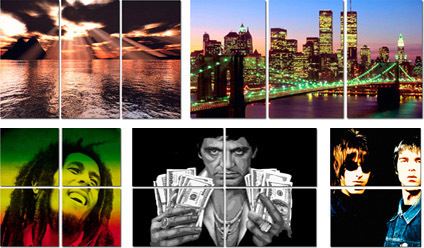 This is an independently run website and as such, we can choose the designs we want to sell so when browsing, you may notice there is more than one Oasis, Scarface and New York City canvas. These are some of our personal favourites amongst the entire range along with the brand new for 2012 3 Dimensional canvas prints we now sell. 3 Dimensional canvas art. Free 3D glasses with each order. They may not be together anymore but what a great band. Large selection of Oasis canvas art available in our music and Limited Edition category. especially proud of. Brooklyn Bridge is heavily featured in this range. International Customers check shipping costs here.